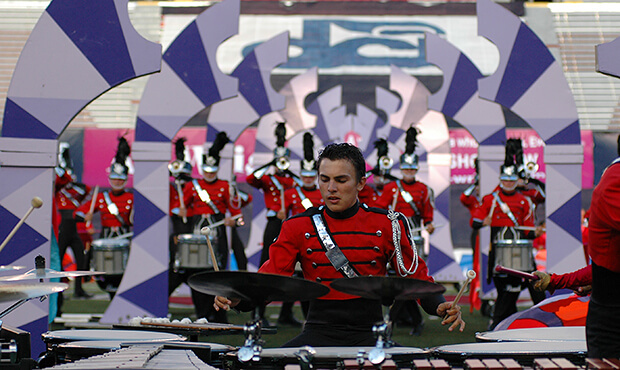 The Drum Corps International World Championships went to Madison, Wisconsin's Camp Randall Stadium for the seventh time in 2006, the venue having undergone a significant modernization and expansion since last hosting the Championships in 2002. The Cavaliers won their seventh title with the robotic "Machine," topping Phantom Regiment's "Faust" by 0.35 and Blue Devils' "Godfather" show by 0.65. Bluecoats achieved its highest placement up until then by finishing in fourth, edging the defending World Champion Cadets by just a tenth of a point. Boston Crusaders' 10th-place show was titled "Cathedrals of the Mind," a production conceived as one movement divided into four segments titled, "Confusion and Provocation," "Sanctuary," "Pathway to Affirmation," and "Delivery and Affirmation." The production introduced spectators to the fresh and invigorating music of composer Jennifer Higdon and kept fans' ears on guard to hear the next hidden snippet of the corps' trademark "Conquest" theme. The show also included snippets of Michel Legrand's "The Windmills of Your Mind" and some original music by corps arrangers Jay Kennedy, Richard Viano, and Jerry Carpenter. "Confusion and Provocation" started with short musical motifs evolving from timpani and chimes. Fourteen tall and narrow half arch props were dispersed across the field as the sound of Legrand's song was heard, written for the 1968 crime thriller, "The Thomas Crown Affair." The song was interspersed with themes from the first movement of Higdon's 2002 "Concerto for Orchestra." Bright, blazing reddish-orange flags the same color as the color guard members' tops contributed to the raucous intensity of Higdon's work, a dramatic essay largely based on octatonic scales. Whereas a regular major scale has seven distinct pitches before repeating "Do" (think "Do-Re-Mi" from "The Sound of Music"), octatonic scales are built upon eight pitches within one octave. The movement titled "Sanctuary" introduced Higdon's 2000 composition "blue cathedral," further interspersed with a couple snippets of the Legrand tune. Higdon's most famous work, one of the most-performed contemporary selections by American orchestras during its first 10 years, was commisioned by the Curtis Institute of Music for its 75th anniversary. Higdon teaches composition at the prestigious Philadelphia conservatory. Higdon wrote "blue cathedral" in honor of her brother Andrew Blue, who died in 1998 of cancer. She wrote: "As I was writing this piece, I found myself imagining a journey through a glass cathedral in the sky. Because the walls would be transparent, I saw the image of clouds and blueness permeating from the outside of this church … I wanted to create the sensation of contemplation and quiet peace at the beginning, moving toward the feeling of celebration and ecstatic expansion of the soul, all the while singing along with that heavenly music." The half arch props now formed a continual arc to the sides and back of the corps, with the reddish-orange flags now taking on a softer quality with streaks of pastels. The "Pathway to Affirmation" segment offered a sense of repose as two of the arches passed by each other and connected to face each other, creating a cathedral arch at the back of the field. "Delivery and Affirmation" began with a section of "blue cathedral" that dealt with Higdon's anger with the death of her brother. The color blue snuck into the orangeness of the flags. 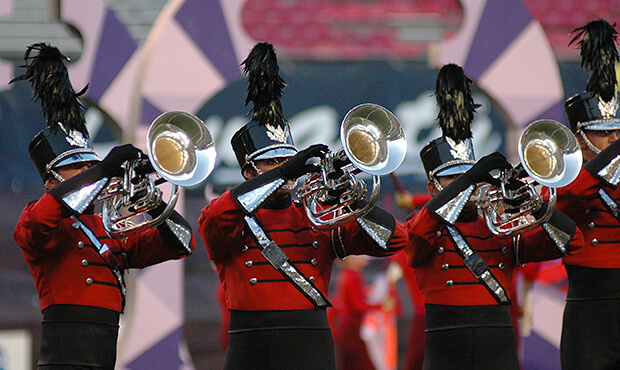 From the front ensemble, brass stabs from the corps' theme song "Conquest" invaded the intense meandering of the curvy drill formations, as chimes played the main melody. For this week only, you can save on the World Championship DVD set that contains this complete Boston Crusaders performance, along with all finalists from the 2006 DCI World Championships. Buy the 2006 World Championship DVD set. (Available this week for 20% off. Regular price: $39.95.) Discount DVD offer ends Monday, December 1, 2014.